Is your basement damp, wet or leaking? This is a common issue for many Ottawa homeowners. The solution is to fix the problem right the first time. 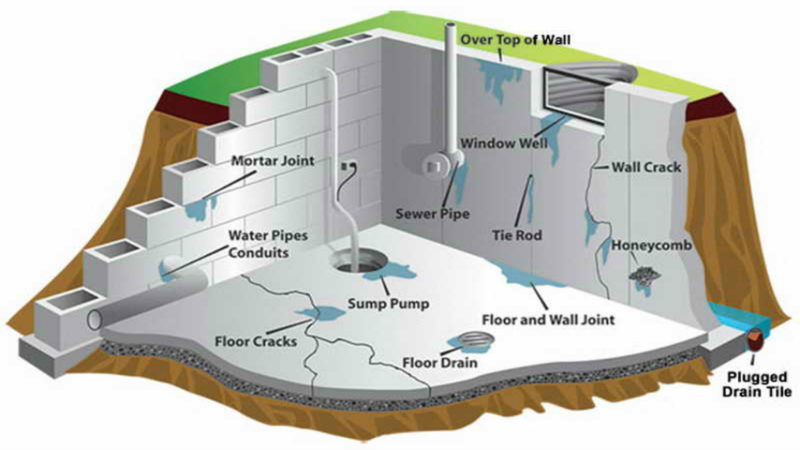 Renco specializes in basement foundation waterproofing and leak repair. All of your activities come with a transferable lifetime warranty and you deal directly with owner, and waterproofing expert Terry Fraser. If you are considering a bathroom project, add us to your bathroom contractor shortlist. 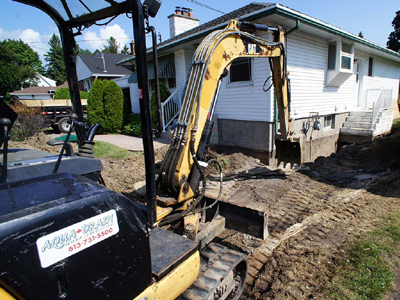 Since 2002, we have been helping Ottawa homeowners keep their basements dry and warm. We provide lifetime transferable warranties, clear timelines and competitive prices with no hidden costs. We take pride in every job, no matter how small or large. Our customer reviews, feedback and repeat work reflect this. Get a basement waterproofing estimate today. Worried about a basement leak or moisture? Contact Renco for a free consultation today. Renco Home Improvements follows a proven step-by-step basement waterproofing process backed by a written lifetime warranty. The foundation waterproofing process starts with the excavation of the soil surrounding your foundation all the way to the footing. 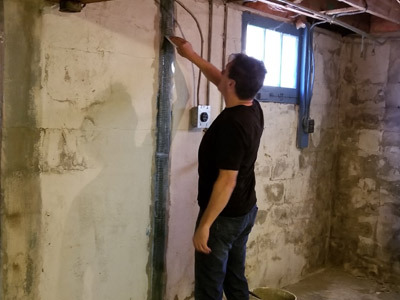 We then examine the existing drainage system and the condition of the foundation wall and footing, and power-wash the foundation in order to properly examine it for damage. This step may vary, depending on whether or not your foundation actually needs repairs. 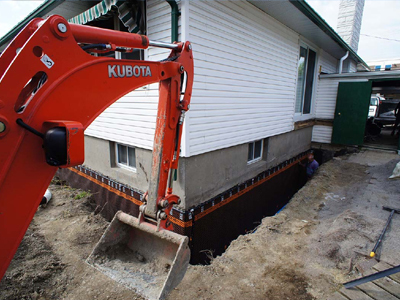 If our excavation and washing of your foundation has found any damage, we will repair it. 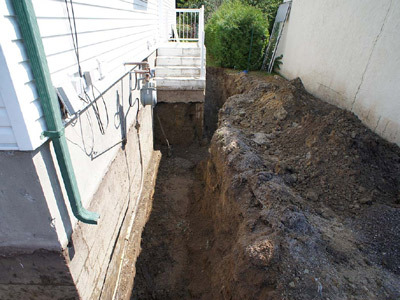 The seam where the foundation meets the footing is the most vulnerable part of your foundation that will typically allow water to seep through into your basement. Adding a concrete bevel around the footing will help to seal it up and prevent water from leaking through. Blueskin is a membrane consisting of rubberized asphalt and polyethylene. It provides a reliable physical barrier that is waterproof, tough and flexible, stretching with your foundation as new cracks appear and providing consistent protection. It is installed on top of a primer material that provides an adhesive surface that lends some amount of dampness protection in itself. Note that the Blueskin membrane provides waterproofing protection and not simply damp-proofing. The air gap membrane is a physical first defense against water which also protects the Blueskin membrane. Air gap membrane is a tough high-density polyethylene sheet that keeps water out. The dimpled structure of the membrane allows any water that slipped past it to drain away and not get trapped between the two membranes. 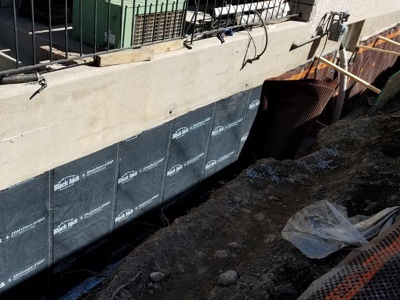 The following two steps in our basement waterproofing process are particularly important, and they involve proper drainage installation and grading. 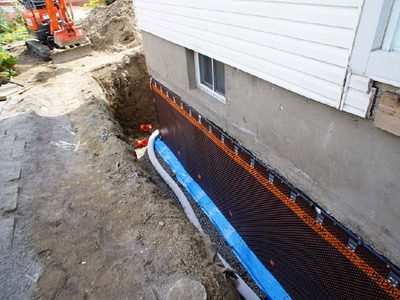 As the Blueskin and air gap membranes do their job of barring water from entering your foundation, they need to be supplemented by a system that drains that water away. 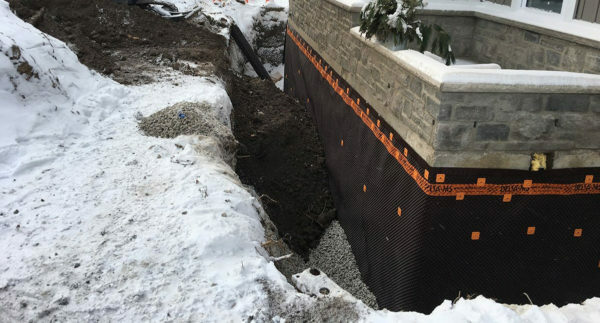 Whatever drainage system you are connected to, be it a city storm drain, a French drain on your property or a sump pit in your basement, we need to install new drainage tile to reach it. In doing this, we lay down a new bed of gravel at your foundation’s footing, and install new window wells and drains if necessary. The new drainage tile is then covered with gravel so that water can easily drain through it. Ensuring proper grading is the final crucial step in the whole waterproofing process. After the foundation waterproofing steps are done, we fill up the excavation around the foundation and create a grade or slope around the house to cause water to flow away from it. It may sound simple, but keeping water from getting to the foundation in the first place is the key to ensuring your basement stays dry. Our service doesn’t stop at providing you with reliable foundation repair and waterproofing. Unlike many foundation repair companies we don’t leave your property without restoring it to its original condition or even better. We have expert landscapers that will come in to clean up, lay down sod and remove any unnecessary waste leaving your property looking the same as it did before, if not better!